For $79.99, gamers get a plethora of items, with slight differences between the PS3 and Xbox 360 editions. Both consoles get the game in a two-disc Steelbook case, with one disc being the game and the other containing an HD behind the scenes “Making Of” featurette. Here’s where it differs: While the PS3 users get the “Making Of” on a Blu-ray disc with optimal video quality (and a free PS3 dashboard theme), Xbox 360 gamers receive a DVD with a compressed HD file — though they also get an exclusive 83-minute “Zombrex Dead Rising Sun” live action film that takes place in the game’s universe. 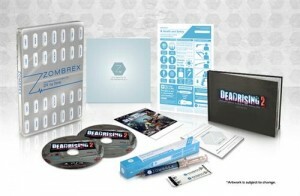 Sales Brochure (16 pages), and most interestingly, a Dead Rising 2 Hardback Artbook (48 pages). 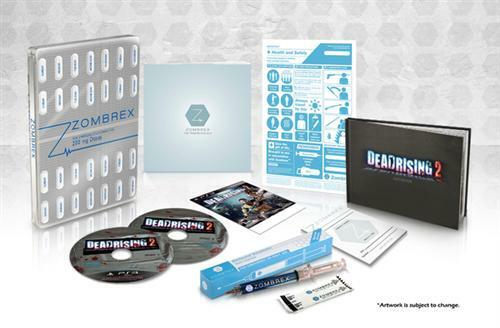 Dead Rising 2 hits September 28th for the Xbox 360 and PS3. You can pre-order it on Amazon here.